Here’s a super simple recipe you guys NEED to try!!! I’ve been making these every week for the last 3 weeks because they turned out AMAZING! These are so so so good! They are a bit crumbly, so I suggest you keep them in the fridge, or expect to make a tiny bit of a mess when eating 😉 They are sweet, delicious, vegan and gluten-free friendly, they don’t have any added sugar, they are high in protein, what else can you ask for? Keep reading for the recipe!
. 1 cup of oats. (feel free to use gluten free).
. 1/2 cup unsweetened coconut.
. 1 scoop protein powder (I like Genuine Health Fermented Powder, vanilla flavour).
. 2 tbsp. hemp hearts.
. 1/3 cup coconut oil.
. 1/2 cup almond butter. Chocolate Coat: 1/2 cup dairy free chocolate (I like to use Camino Semi-Sweet baking chocolate) + 1 tsp. coconut oil.
. Line a rectangular pan with parchment paper.
. Place the almond butter and the coconut oil in a bowl and microwave for about 30-45 seconds. Take out and stir until combined. Add vanilla.
. 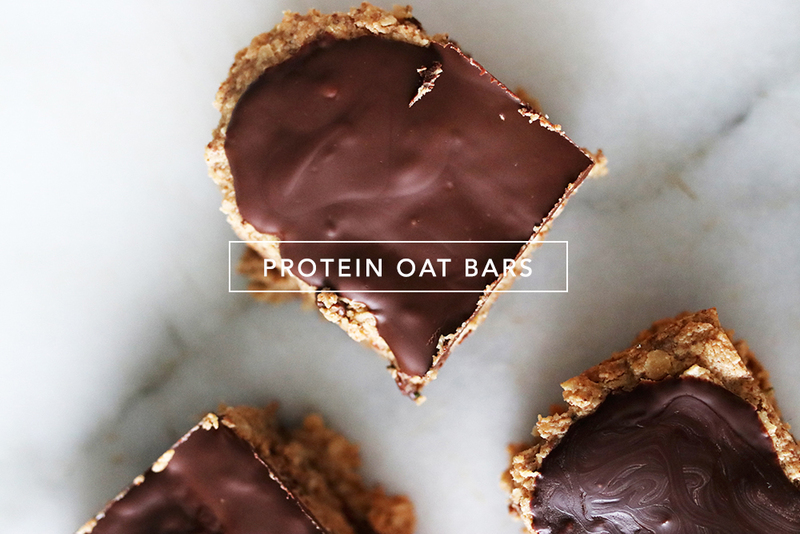 Combine oats, almond flour, coconut, protein powder, and hemp hearts.
. Mix wet and dry ingredients.
. Spread the mixture on the pan evenly and bake for 15-20 min.
. Let cool and in the meantime melt 1/2 cup chocolate with 1 tsp. coconut oil. You can do this on a double boiler but if you can’t be bothered (that would make two of us! ), you can definitely do it in the microwave or directly in a small pot at very low temperature. Your choice! 😉 Just make sure you don’t over cook it, and stir very well with a spoon. * Alternatively, you can cut into squares before spreading the chocolate and then proceed to top each separately.